We've all seen the "news" -- the great Measles Outbreak of 2019 means we must abandon our universal right to Informed Consent and all be forced to "take the shot" or else... Something Terrible Might Happen. Except, the scientific record does not accord with the vaxx-pusher propaganda! Where is the outbreak? It is among the vaccinated! The 2019 "outbreak" if it exists just proves the failure of vaccination as a public health strategy -- especially the MMR (Measles, Mumps and Rubella) vaccine. While a truly troubling outbreak, the Los Angeles Typhus Outbreak of 2018 highlights a serious risk to public health, there is no hue and cry over the shocking increase in Typhus cases from "zero" few years ago to 2 in 2017 and over 120 in 2018. Why no media frenzy over this deadly disease? Maybe because there is no commercially available Typhus vaccine? The recent decision by Rockland County, NY to ban all unvaccinated children from school and all public places is a very troubling and wrong decision. That this draconian decision will impact the 27% of the children who are not vaccinated "against" measles is shocking. That most of these children are Orthodox Jews adds the horror of Vaxx Apartheid to the public health threat posed by the recently vaccinated. The vaxx-pushers are coming after us all. Act now! Across the United States*, triggered by a small up-tick in the few cases of measles, and although more children die from the "unavoidably unsafe" measles vaccine than from the disease itself, legislators are demanding "tougher laws" forcing families to vaccinate, or lose public benefits. That these same legislators are beneficiaries of significant drug company political payments is not surprising. What is surprising is the legislators willing connivance with those who push forced vaccination as somehow a "public health benefit," despite the failure of the US government to provide any of the vaccine safety reports that have been required by law since 1986. When Congress abrogated our right to petition the federal and state courts for vaccine injuries in 1986 the promise was that vaccines would become safer and that the federal government would report to Congress annually about progress. No such reports have been submitted while families have suffered thousands of dead and maimed children as the legacy of US vaccination policy. The horrors of vaccine pseudo-science could, perhaps, have been tolerated, since families could have, in the past, always opt out of vaccination for religious or philosophical reasons. Where there is risk, there must be choice. However, that promise of Informed Consent is now under concerted attack in state after state. Exemptions created by legislators can be abolished, it is claimed, by legislators. That's may be accurate, but only if the change in law does not violate our inalienable rights. Legislators must understand international limits on their asserted power over the issue of forced vaccination. Wars have consequences and one of the consequences of WWII was the enactment, as part of customary international law, binding on all nations, of the Nuremberg Code. US government, during the Subsequent Nuremberg Trials, and specifically the infamous Nazi Doctors Trial, promulgated the Nuremberg Code, as a restatement of the existing law of Informed Consent. It tried and hung Nazi Doctors for crimes against humanity -- violating the universal right of Informed Consent. It did so under the Geneva Convention provisions that say a power holding a prisoner of war may try the prisoner for war crimes only if the same law applies to the country holding the prisoner. Thus, by action of the Geneva Conventions the Nuremberg Code applies in the USA. I’ve written a detailed Brief on the Law of Informed Consent here: http://drrimatruthreports.com/a-brief-for-informed-consent/ — showing how subsequent international law (including the UN Bioethics Declaration), US statutory law and cases support the right. In one recent case, Missouri v McNeely, 569 US 141 (2013) the Supreme Court said, even a “…diminished expectation of privacy does not diminish the… privacy interest in preventing a government agent from piercing the… skin. And though a blood test conducted in a medical setting by trained personnel is less intrusive than other bodily invasions, this Court has never retreated from its recognition that any compelled intrusion into the human body implicates significant, constitutionally protected privacy interests…” (page 15). The relevant point is that legislators, whether state or federal, have no authority to disregard the right of Informed Consent. If they do so, they too stand in the Nuremberg Docket with the Nazi Doctors. There is no middle ground. Either a politician stands for the universal right of Informed Consent or is aiding and abetting crimes against humanity. * And in the EU, Canada, Australia and elsewhere. While Vancouver declared an "outbreak" over 9 measles cases, Los Angeles has suffered a dramatic increase in typhus cases, from 2 in 2017 to at least 120 in 2018 with barely a mention in the drug-company-advertising dependent mass media. Maybe because there is no commercially available typhus vaccine? Here is the situation in a nutshell: Informed Consent is a fundamental human right protected against any diminishment through any denial of philosophical or religious conscientious objections to mandated vaccination. Informed Consent is a separate, specially protected legal concept and right. It is completely separate from statutory exemptions which means that it may not be abolished by ANY legislature. The fact is, however, that the universal right to Informed Consent is utterly meaningless without the right to refuse ANY medical intervention, including vaccination. This right is not only protected under international treaty law, which controls US law, but it is also a First Amendment-protected expressive association right: the right to express “No!” to government-mandated medical intervention. We are happy to report that New Jersey health freedom advocates have successfully resisted attacks on vaccine freedom of choice nearly annually for over the past decade. Once again, however, the state government is poised to attempt to eliminate religious exemptions in the Garden State. This time the tactic is to amend an already unacceptable pending bill that was supposed to “reform” the traditional religious exemption by making it harder to use a religious exemption. That bill, A3818 (S2173), has been amended to abolish religious conscientious objections and is being rushed through the legislature as you read this. This push against conscientious objection is absolutely contrary to our state’s legal tradition and illegal under both the Constitution of the United States and International Treaty Law. New Jersey has a long and honorable tradition of protecting religious conscientious objections to forced medical interventions which is completely in keeping with our tradition of religious liberty. Yet somehow, the state of New Jersey wants to act as if it is not bound by these laws, treaties and principles: If Bill No. A3818/2173 is passed as currently amended, it is poised to adopt a disastrous law which is clearly “contrary to human rights, fundamental freedoms and human dignity…”. True, the legislature may have power to repeal an exemption it granted many decades ago, no matter how unwise that repeal may be, but the legislature does not have any lawful authority to repeal the universal right to Informed Consent. Nor does it have authority to condition any other right, such as the right to a free public education, upon the surrendering of the right to Informed Consent. Such a condition is an “unconstitutional condition” which federal courts are empowered to overturn. This is extremely serious and goes well beyond vaccination choice. If we allow the legislature of New Jersey to adopt A3818 it is adopting a law that effectively forbids parents from expressing their conscientious objection to mandated vaccines. This bill is a free speech-gagging bill that violates fundamental First Amendment rights to religious liberty, freedom of speech and freedom of association. It further attacks the universal right of Informed Consent. It places the legislature of New Jersey in (one hopes unintended) league with the Nazi Doctors who were rightly condemned and executed for violating Informed Consent, by the whole world at the Subsequent Nuremberg Trials. Ironically, these Subsequent Nuremberg Trials were conducted by just one ally, The United States because so many in the US were shocked to the core by a system and its medical servants who would, and could, take away the rights of people to exercise control over their own bodies. We must raise our voices now and remind the legislators of New Jersey that we are still shocked to the core by any such attempt, especially here on US soil. No person of conscience can remain silent in the face of this brutal attack on one of the deepest foundation stones of the fundamental moral basis of civilization. If we remain silent, and this bill passes, shame on us. Vaccines have been declared by our courts to be “unavoidably unsafe.”  Where there is risk there must be Informed Consent. Anything less returns us to the barbarism that was outlawed at Nuremberg. There are three actions to be taken here. One is personal and two are social. First, Protect yourself and the ones you love by asserting your right to Informed Consent with the Advance Vaccine Directive card: https://tinyurl.com/AVDcard. Second, click the link below to let your voice resonate in the ears of the New Jersey legislature. Once you fill in the form, I’ll add your name as a signatory to our Open Letter to the NJ legislature. Please add your name whether you live in New Jersey or not. By the way, as our Thank You, you'll receive a subscription with no cost to you to the Health Freedom Newsletter from Dr. Rima (Rima E. Laibow MD). Third step, and this is very important, is to share this item and this link -- http://drrimatruthreports.com/new-jersey-attacking-vaccine-conscientious-objection/ -- on Social Media of all types. Let your Circle of Influence know that the battle is raging and we need their support. And urge them to share it, too. Oh, yes, remember to contact your state legislators directly if you live in NJ! Emails and phone calls to the legislators will make a difference, but only if you do it now! Also, a list of Senate health committee members with email addresses is at the bottom of this post. https://fundly.com/support-natural-therapies/ I have been working closely with an integrative practice in New Jersey for years helping them stand up to the state medical board and Horizon BCBS as their practice has been harassed since 2012. By the way, since this practice first opened in 2002, not one patient has ever filed a complaint. When the state medical board and the largest insurer in the state set their sights on an alternative medicine practices, they usually shut the practice down. This is because most alternative providers can’t afford a multi-year a legal defense. However, with a little support from folks like you, a judge just ruled against Horizon BCBS as it asked the judge to rule in its favor without going to trial. The law firm handling this case says it doesn’t know of another example where a small provider survived this type of Summary Judgment attack! 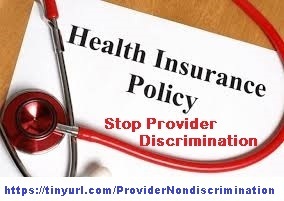 The Affordable Care Act (ObamaCare), Section 2706(a), prohibits insurers from discriminating against healthcare providers who are acting within their legal scope of practice. Horizon is saying it doesn’t have to cover alternative medicine, even though it is being delivered by an MD, advanced practice nurses and a naturopath, working under them. What this means is that this case may be a proper vehicle to test the extent of the PHS’s “provider nondiscrimination” clause — this case may set a precedent forcing insurers to cover holistic and integrative care! You can help set an important legal precedent with a small donation to put insurers on notice that the courts are going to require them to obey the law and cover holistic and integrative care! Small donations from large groups of consumers and providers will help assure more people have access to alternative medicine and harassing providers legally is less attractive to insurers. As little as $5 can help assure that insurers like BCBS are forced to comply with Section 2706 of ObamaCare which states:“a group health plan and a health insurance issuer offering group or individual health insurance coverage shall not discriminate with respect to participation under the plan or coverage against any health care provider who is acting within the scope of that provider’s license or certification under applicable state law.” (emphasis added) We strongly believe that getting this case before a jury will prove, not only that BCBS and the State Medical Board are discriminating against this practice, but that this law cannot be ignored without consequences. By supporting this case, consumer access to holistic MDs, DOs, advanced practice nurses, chiropractors, acupuncturists, naturopaths, midwives, behavioral health providers and more can grow as more insurance reimbursement for holistic and integrative alternatives gain the reimbursement their patients deserve and want. ------------------  The Affordable Care Act (ACA, or Obamacare) amended the Public Health Services Act (PHS) by adding section 2706(a). “The statutory language of PHS Act section 2706(a) is self-implementing and the Departments do not expect to issue regulations in the near future. PHS Act section 2706(a) is applicable to non-grandfathered group health plans and health insurance issuers offering group or individual health insurance coverage for plan years (in the individual market, policy years) beginning on or after January 1, 2014. Until any further guidance is issued, group health plans and health insurance issuers offering group or individual coverage are expected to implement the requirements of PHS Act section 2706(a) using a good faith, reasonable interpretation of the law. For this purpose, to the extent an item or service is a covered benefit under the plan or coverage, and consistent with reasonable medical management techniques specified under the plan with respect to the frequency, method, treatment or setting for an item or service, a plan or issuer shall not discriminate based on a provider’s license or certification, to the extent the provider is acting within the scope of the provider’s license or certification under applicable state law. This provision does not require plans or issuers to accept all types of providers into a network. This provision also does not govern provider reimbursement rates, which may be subject to quality, performance, or market standards and considerations. Not such a good election for the "(G)OP" (that means "(formerly) Grand Old Party") and the Demoncrats get to be led by one of the most out-of-touch crony pols of all times, Nancy Pelosi! For Libertarians, however, this was a great election. "Libertarians in states without automatic ballot access have to spend an inordinate amount of time, money, and effort every year qualifying their candidates through petitioning. Fortunately, Libertarian Party vote totals in a few states have qualified them for future ballot access. Oklahoma has some of the strictest ballot access laws in the country, which has historically made it a difficult state for Libertarians in past elections. Fortunately, Libertarian John Yeutter won nearly 25 percent of the vote in his race for Oklahoma auditor and inspector, which secures Libertarian Party ballot access until 2022. “Taxpayers in Oklahoma should have assurance that their state and local tax dollars are accounted for,” Yeutter said in his campaign. In New York, Libertarian Larry Sharpe received an unprecedented 89,232 votes for governor, far in excess of the 50,000 needed to assure Libertarian Party ballot access in New York for the next four years. Sharpe ran an active campaign, with appearances throughout the news media and interviews on television and radio. In 2016, Sharpe was also only 32 votes short of being selected as the Libertarian Party’s vice presidential candidate. The stakes are just too high to stay home. The future of our democracy is at stake. While Ds and Rs stoked voters’ fears in order to drum up record-breaking voter turnout in some areas, our 833 Libertarian candidates campaigned on practical solutions to improve America’s communities. As Libertarians, we take a different approach than our opponents do; we appeal to common sense. Our solutions cut taxes, improve lives, and present opportunities to make communities more free and prosperous. 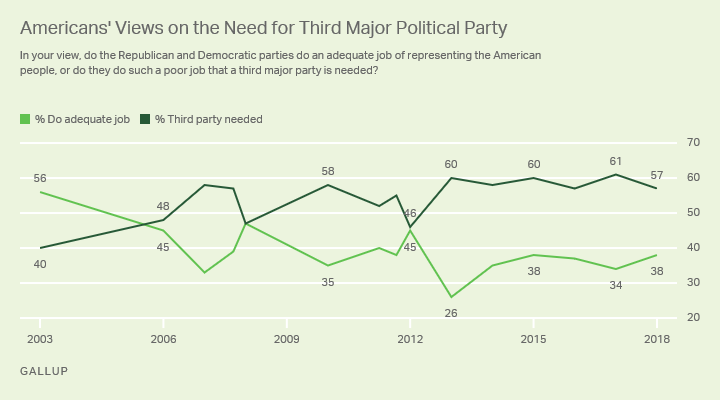 My conclusion is that the time has never been better for the Libertarian Party to confirm its "major party" status, returning real democracy to the American federal republic. Americans no longer have just two choices. 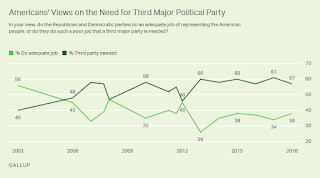 There is a third choice to Demoncrat and (G)OP politics-as-usual. That choice is Liberty! Larry Sharpe received 90,816 votes in his race for governor of New York, well over the 50,000-vote threshold to assure Libertarian Party ballot access in New York through 2020. John Yeutter won nearly 25 percent of the vote in his race for Oklahoma auditor and inspector, which secures Libertarian Party ballot access through 2022. Voters numbering 1,609,716 cast their ballots for Mark Ash for Texas Court of Criminal Appeals, Place 8. His 25.3 percent result serves to assure LP Texas ballot access through 2020. Richard Brubaker, running for the U.S. house from Wyoming, received enough votes to retain Libertarian Party ballot access for the state. Mark Rutherford assured Indiana ballot access until 2022 with his race for secretary of state. In Massachusetts, Daniel Fishman has assured ballot access for two more years in his race for auditor. Informed Consent Action Network v.
This Informed Consent FOIA case means all vaccine mandates are illegal because the drug companies and the government have failed to obey the law. This means your Informed Consent right to refuse all vaccines is more important than ever before. You must assert the right or you will be "deemed" to have "waived" the right! That's where the AVD Card counts. Sometimes you win by voluntarily dismissing your case. That's what happened a few weeks ago when the Informed Consent Action Network voluntarily dismissed its Freedom of Information Act (FOIA) case against the Secretary of Health and Human Services (HHS). Earlier this year the Network sought copies of the Reports that the infamous 1986 Vaccine (sic) Safety Law required the Secretary to provide to Congress every two years. Let's remember where that all started. In 1976 we had the First Swine Flu Pandemic Vaccine. Over 400 people died from the vaccine and the drug companies had to withdraw the vaccine, subsequently, there was no flu pandemic. The lawsuits started. Then the companies told Congress they would withdraw from the vaccine business unless Congress "protected" them. It did. The 1986 law, which unconstitutionally took away from us our First Amendment Right to Redress of Grievances regarding vaccine injuries, also commanded the Secretary to make sure vaccines got safer, and to report to Congress about that every other year. As we've known for some time, that never happened. Vaccines got much, much more dangerous -- "unavoidable unsafe" as our Courts have said, and the Secretary never told anything to Congress. We now know the truth, as a result of the FOIA suit. Below is a copy of excerpts from the stipulated Order regarding the FOIA action. It sets out the wording of the law requiring the Secretary to tell Congress, and all Americans, the truth about vaccine safety. The final paragraph is what the Secretary told the Court: the Reports required by the Law were never made! The smoking gun of vaccine lies! What can you do about the Secretary's failure to obey the Law and make sure vaccines are safer? What can you do to protect yourself and your family? You must assert your right of Informed Consent. You can, and must, refuse all vaccines! Is Alex Jones the “Canary in the Coal Mine”? And They are Doing a Pretty Good Job of It! Perhaps thereby proving Alex Jones’ “conspiracy theories” by targeting him. [ September 11, 2018 Update: Twitter joined the rest of the crony corporate media in banning AJ a couple days ago. AJ had just confronted a crony corporate shill CNN reporter (whose complaint to social media sites triggered the original Bannings) in the halls of Congress and live streamed the confrontation over Twitter's live stream platform. That powerful use of live truth apparently was deemed "harassment" by Twitter's controllers. Since the start of the Bannings Alex Jones' website -- www.InfoWars.com -- has gained over 1,000 positions in global web site ranking, according to industry source Alexa. Just look: https://www.alexa.com/siteinfo/infowars.com. Facebook deletes unpopular/challenging/unacceptable ideas. They claim to have the “right” to do that:as they are [allegedly] a private company. YouTube/Google remove anti vaccine and other unpopular-challenging corporate-control-averse and, at their whim, edit contrary thought with “corrective” intrusions. They maintain that they have the “right” to do so because they are a[n] [allegedly] private company. They use our public airways, have massive contracts with public sources (that is, get paid with YOUR dollars by NSA and the like) and benefit from a government-maintained monopoly status. And what used to be the constitutional protection of our foundational concepts has vanished into an electrosmog haze of privatized tyranny and censorship. The government does not have to do a thing but sit idly by while its tax-subsidized, defense contract enhanced corporate “partners” do its dirty work in exactly the same way that hospitals and schools have institutionalized totally illegal vaccine mandates in violation of Informed Consent. The First Amendment’s “Congress shall make no law...” censoring speech remains the law, but it is increasingly a “dead letter law.” This trick, where the Deep State pretends that the old freedoms remain, is itself an old trick. Part of the trick is to create structures that seem to be protecting the freedoms while they actually destroy them. Control over most humans had been maintained for millennia through the use of religious and, later, political ideologies inevitably justifying the dominance of the few over the many, even when the controllers pretend to speak for, and protect, the “majority”. But in more modern times the structure of bureaucracy itself has been redesigned to become, not just to serve, the control system. Consider, for, example, how the regulatory structure of the Deep State’s Military Draft was used in the USA during the 1960s and ‘70s to “channel” students into certain fields, such as science, engineering and weapons design, which were considered of benefit to the state. Now we see the same process at work with the incessant demands for ever more vaccines, and for forcing adults and children to receive all the vaccines that crony corporatist-tainted science can concoct without regard for either scientific validation or personal rights. However, in 2009, during the Swine Flu Vax Panic, the would-be tyrants, who planned to vaccinate every American “starting with the volunteers” with unsafety tested vaccines (with the supply “stretched” by adding the adjuvant Squalene, at levels shown to cause irreversible infertility in Patents held by the US government) found themselves stymied by a population that refused to cooperate and who, in the millions, told their “representatives” so. The plan collapsed and even the first responders were able to escape state vax mandates unharmed, though that took a law suit. There was no pandemic. The incipient tyrants learned an important lesson from the power of our Push Back: overt Federal mandates will be resisted. That is when we began to see the authorities passing off the mandates to allegedly private actors for enforcement. While this privatizing of tyranny works to increase censorship and impose unlawful financial controls, the vax mandate gambit remains a primary example of this political process. It is, as I said, an old trick. Very old. That ancient order was supposedly overthrown in recent centuries by the great liberal (in its original sense) revolutions which established the primacy of individual freedom, “We hold these truths to be self-evident, that all men are created equal, that they are endowed by their Creator with certain unalienable Rights; that among these are Life, Liberty and the pursuit of Happiness. That to secure these rights, Governments are instituted among Men, deriving their just powers from the consent of the governed.” – Declaration of Independence of the United States of America. In 2017 I wrote about this issue in an article published on the news aggregation site, www.OpenSourceTruth.com , and warned that by privatizing censorship we were institutionalizing tyranny, allowing the Crony Corporate State to destroy our liberty. Unfortunately, I was all too right. It is reported that Marc Zuckerberg personally de-platformed Alex Jones on his own, but that hardly explains the rest of the de-platforming. Unconstitutional Mandates "for the good of the Children." When Governor Jerry Brownshirt of California signed SB277 into law in 2015 he gave California parents an unconstitutional choice between their child receiving the so-called “free public education” promised by the California Constitution, or, their family exercising the universal right to Informed Consent by interposing their conscientious objection to vaccines. The California governor violated basic norms of civilization. He enlisted not just the government’s schools, but even private and religious schools in his plan to force children to receive dozens of “unavoidably unsafe”, uninsurable vaccines. The state pretends to recognize our traditional right to freedom of choice, but it actively seeks the complete elimination, the total abrogation of that right. Control over most humans had been maintained for millennia through the use of religious and, later, political ideologies inevitably justifying the dominance of the few over the many, even when the controllers pretend to speak for, and protect the “majority”. This strict social control dominated human society for most of its existence through the use of what early freedom theorists such as the American abolitionist Lysandor Spooner saw as the great monopolies created by political power.. These included the monopolies over conscience embodied by state religions, over the bodies of certain people (e.g., chattel slavery; prisoners, war captives, caste system members, etc. ), or the property rights of approximately half of the species (the legal “infirmities” of women, etc.) and over all property through royal claims to “own” the land and economic activities of a territory (feudalism and mercantilism). But in more modern times the structure of bureaucracy itself has been redesigned to become, not just to serve, the control system. Consider, for, example, how the regulatory structure of the Military Draft was used in the USA during the 1960s and ‘70s to “channel” students into certain fields such as science, engineering and weapons design, which were considered of benefit to the state. Now we see the same process at work with the incessant demands for ever more vaccines, and for forcing adults and children to receive all the vaccines that crony corporatist-tainted science can concoct without regard for either scientific validation, evidence of safety (both are required by law and totally lacking in the US!) or personal rights (protected by international and national law and totally ignored unless we, the owners of our bodies take the trouble to assert it correctly) . However, in 2009, during the Swine Flu Vax Panic, the would-be tyrants, who planned to vaccinate every American “starting with the volunteers” with unsafety tested vaccines (with the supply “stretched” by adding the dangerous and equally unsafety tested adjuvant Squalene, at levels shown to cause irreversible infertility in Patents held by the US government!) found themselves stymied by a population that refused to cooperate and who, in the millions, told their “representatives” so. Their mandate was announced to Congress by then Secretary of Health and Human Services Kathleen Sebelius on September 15, 2009. Secretary Sebelius did not ASK Congress for approval of her plan. She announced that the plan was already fully funded, that $4.5 BILLION dollars had been spent on the unsafety tested squalene adjuvant and billions more on the unproven vaccines. She announced that 90,000 vaccine administration centers would be set up around the country and that the mercury-squalene-aluminum mix would be administered to every man, woman and child in the US starting with “those who want it first”. Listened and assented by its silence, maintaining the appearance and forms of governance, but, in reality surrendering that governance to the bureaucratic operatives of the Deep State, doing absolutely nothing to protect either the health or the bodies of the citizens they are, in fact, sworn to protect and the constitution they are sworn to protect and defend. Popular outrage, mediated by internet tools available to share the information led to the collapse of the plan and even the first responders were able to escape state vaccine mandates unharmed, though that required a law suit. There was no mass vaccination so there was no pandemic. I am proud to have been, as a Trustee of the Natural Solutions Foundation, one of the architects of that mass refusal in which millions of people told these cowardly constitutional failures, “Don’t you dare!” And they didn’t because, with that mass opposition, they couldn’t. The incipient tyrants learned an important lesson from the power of our Push Back: overt Federal mandates CAN be resisted and, if the information is available, WILL be resisted. That is when we began to see the authorities passing off the mandates to allegedly private actors for enforcement. Read on to see how this privatizing of tyranny works to increase censorship and impose unlawful financial controls. The vaccine mandates gambit remains a primary example of this tyrannical political process. The CDC Advisory Committee on Immunization Practices (ACIP) which approves vaccines is so completely corrupted by crony corporate interests that they actually had to change the rules to allow the conflicted members to vote nonetheless, or there would never be a quorum because they ALL have serious conflicts of interest. One example: Paul Offit, MD, a so-called “ethicist” and physician from a famous children’s hospital, was allowed to vote to “recommend” a vaccine in which he had a Patent interest; his vote netted him tens of millions of dollars in the first year of its “recommendation” alone. Meanwhile the US government, deeply involved in approving and disseminating vaccines, through mandates and sponsored propaganda, owns financial interests in over 50 vaccine Patents. After the CDC “recommendation” is voted the privatization of the mandate starts, with some local governments issuing mandates, but with private hospitals requiring staff to be vaccinated, even staff members who never have patient contact. Similarly, schools join in the rush to increase their vaccine levels (as higher vaccination rates translate into more Federal and State money for the institution) – in one particularly egregious example from 2007, Prince Georges County, Maryland revaccinated hundreds of children literally at gun point to prevent the loss of hundreds of thousands of dollars a month in Federal subsidies. The school system claimed it had lost the vaccination records of nearly a thousand children. This is, in fact, a less known form of human trafficking, selling children’s bodies for money to the agency of the State required by law to protect these same children, body and mind. Their vaccination-mandate-for-pay damages those same children, body and mind, while abrogating their fundamental rights. But the pay is great and maybe the basketball team sees some of it. We now see a disturbing trend where private employers join the mandate madness although the businesses have nothing to do with health care. This trend is building despite the fact that the courts have clearly held that people retain their right to Informed Consent even where governments are restricting religious and philosophical conscientious objections to vaccination. Several years ago, an Administrative Judge in New Jersey held that it was illegal to fire a nurse for refusing vaccines for philosophical reasons while the people were permitted to assert a religious conscientious objection to refuse the injection. As recently as 2013 the US Supreme Court upheld Informed Consent, stating, Even a “…diminished expectation of privacy does not diminish the… privacy interest in preventing a government agent from piercing the… skin. 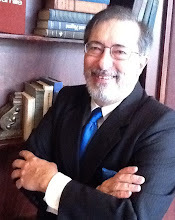 And though a blood test conducted in a medical setting by trained personnel is less intrusive than other bodily invasions, this Court has never retreated from its recognition that any compelled intrusion into the human body implicates significant, constitutionally protected privacy interests…” Missouri v McNeely 133 SCt 1553. As a side note, McNeely teaches us that unless you assert your right to Informed Consent, it will be deemed waived. 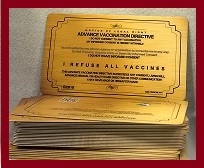 Assert your conscientious objection to forced vaccination with the Advance Vaccine Directive card, http://tinyurl.com/AVDcard – an advance medical directive that must be respected by ethical health care professionals. First they came for the Neo-Nazis and banned them from Facebook. No one protested. Then they came for Alex Jones and banned him from YouTube and Facebook. Almost no one protested. Then they came for... You know the rest... they came for you and me, and no one was left to protest. These supposed private Social Media Companies are actually exercising government authority. Just as much as if they had been the “private” Tax Farmers of Ancient Rome. They are the privatized agents of control and censorship. They exercise this control on several levels. Each of these mega-corporations is, in fact and in law, “a creature of the state.” It is created by registration with government that gives it authorities (such as limited liability to third parties) which it could not exercise as a truly private association. If the same Rule of Law that applies to truly private actors applied to government and its crony corporations, “content control” efforts would be understood to be exactly what they are: censorship. Real free market competition and technological progress would rapidly make the near-monopoly power of Google and Facebook irrelevant. If the same Rule of Law that ought to apply to Government Censorship – that there can be no such law – applied to the crony corporations, YouTube, Facebook etc. “private” censorship could not remain.